Five hundred years old walls keep more secrets than a human mind can ever possibly imagine. There is nothing that they haven’t witnessed: forbidden romance, triumph of kings and little pleasures of common people, betrayal and despair, a miracle of new life, and simply every day routines of people one generation after another. The kings of Golconda Fort knew that even walls have ears very well, and some of those “ears” they even installed themselves. If you stand in one corner of the royal room and whisper something so quietly that you can barely hear it yourself, be sure that it will be heard meters away by a person who happened to be standing in the opposite corner, and the quality of the sound will be better than in your mobile network. Astonishing acoustical system of the Fort was used not only for eavesdropping and secrets exchange, but also as an essential security alarm system: if you clap at the bottom of the hill at the entrance, it will be clearly heard in the citadel on the top of the hill which is about 100m away. The number of claps was meant to signal, who had entered the gate: a friend, a stranger or a foe. If you proceed to the judicial office, you will find one more spot with exceptional acoustic designed for security reasons: during the hearings a judge was watching a defendant through a small window, positioned some meters away from where a suspect was placed. But even if he seemed to be far, the walls were designed in such a way that even a sub-audible sound of clothes being touched with fingers was clearly heard by a judge, sounding like a loud clap. If a furious criminal attempted to take a knife out of his pocket to throw it at a judge, it could be easily heard, no matter how quite he tried to be. 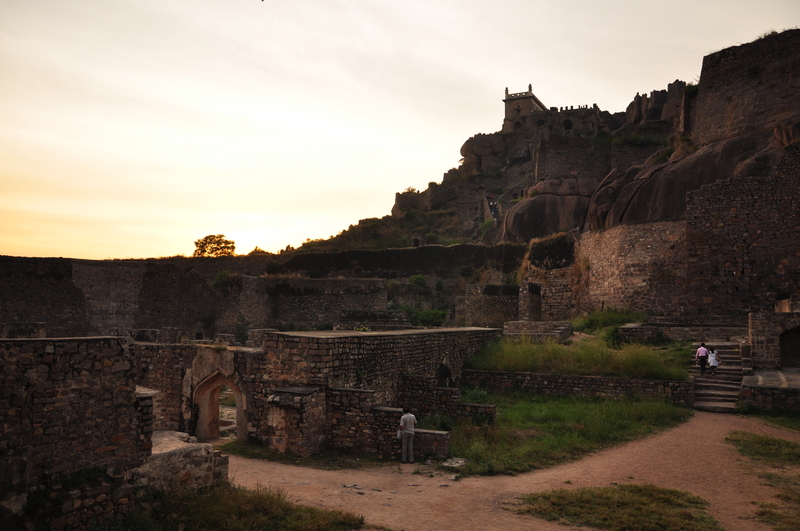 Nowadays Golconda Fort is one of the most famous attractions of Hyderabad for tourists, and a favorite romantic spot for locals. 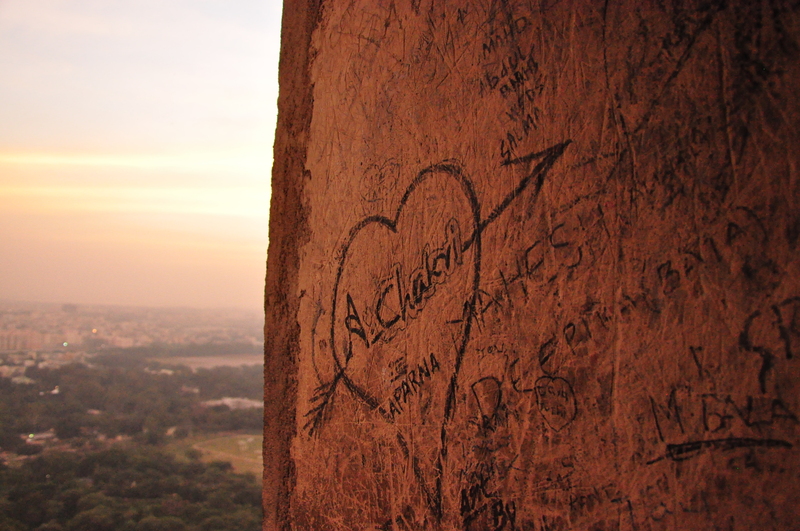 Hours can be spent roaming among the ruins, climbing rocks and admiring the remains of history. 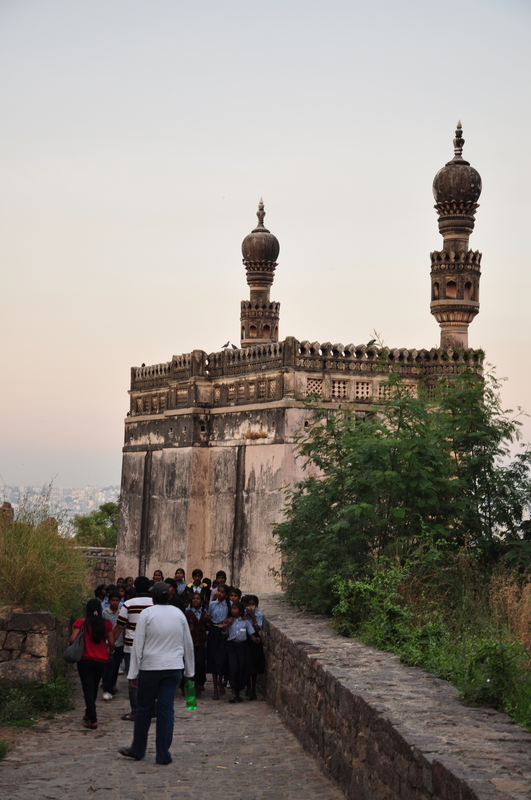 After 5 pm, visitors of the fort hurry up to reach the top of the hill, first passing by a Mosque and then a Hindu Temple, to admire an astonishing view of Hyderabad in the pinkish sunset light. Admiring all the beauty of the authentic citadel with the remains of original architecture, it is however impossible not to feel deeply sad because of the unbelievable vandalism, well documented on the walls. Thousands and thousands of names of visitors and love expressions carved on the 500 year old walls… this part of human nature will always be a mystery for me. A day at the fort usually ends with a famous light show, which is held in the middle of a former palace right next to the queen chambers. The show is basically a combination of light and sound, during which a story of the fort is told. You might struggle to remember all the rulers and kings names mentioned in the show and at times be slightly discouraged to concentrate because of mosquito attacks, but I would never miss the chance to see the empty fort beautifully lit at dusk, surrounded by the sound of melodic ghazals.